Rivers control the movement of sediment and nutrients across Earth's surface. Understanding how rivers change through time is important for mitigating natural hazards and predicting Earth's response to climate change. We develop a new computer model for predicting how rivers cut through sediment and rock. Our model is designed to be joined with models of flooding, landslides, vegetation change, and other factors to provide a comprehensive toolbox for predicting changes to the landscape. 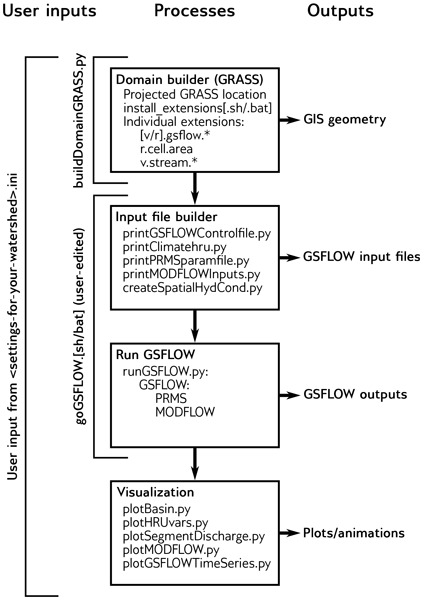 OverlandFlow is a 2-dimensional hydrology component contained within the Landlab modeling framework. It can be applied in both hydrology and geomorphology applications across real and synthetic landscape grids, for both short- and long-term events. 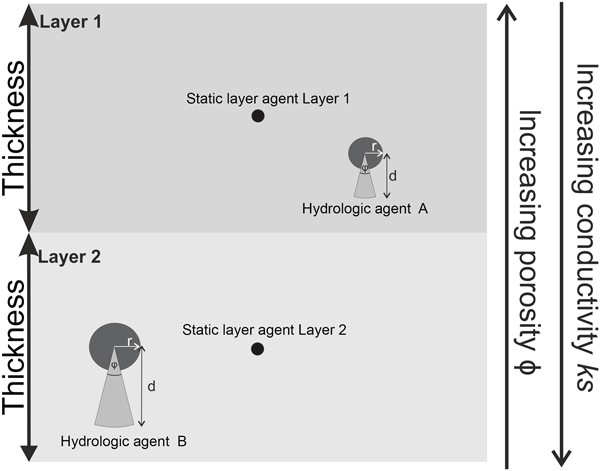 This paper finds that this non-steady hydrology regime produces different landscape characteristics when compared to more traditional steady-state hydrology and geomorphology models, suggesting that hydrology regime can impact resulting morphologies. Many geoscientists use computer models to understand changes in the Earth's system. However, typically each scientist will build their own model from scratch. This paper describes Landlab, a new piece of open-source software designed to simplify creation and use of models of the Earth's surface. It provides off-the-shelf tools to work with models more efficiently, with less duplication of effort. The paper explains and justifies how Landlab works, and describes some models built with it. This paper presents a new Python-language software library, called CellLab-CTS, that enables rapid creation of continuous-time stochastic (CTS) cellular automata models. These models are quite useful for simulating the behavior of natural systems, but can be time-consuming to program. CellLab-CTS allows users to set up models with a minimum of effort, and thereby focus on the science rather than the software. 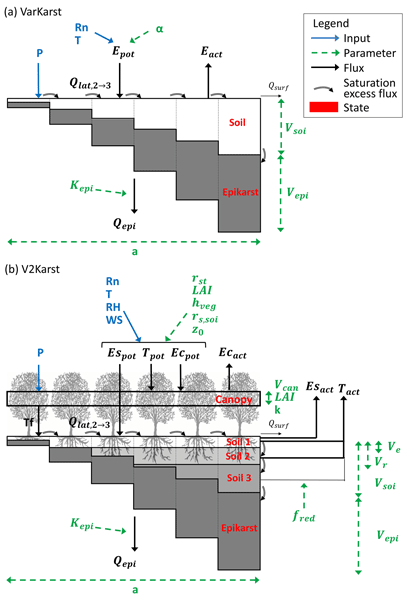 We propose the first large-scale vegetation–recharge model for karst regions (V2Karst), which enables the analysis of the impact of changes in climate and land cover on karst groundwater recharge. We demonstrate the plausibility of V2Karst simulations against observations at FLUXNET sites and of controlling modelled processes using sensitivity analysis. We perform virtual experiments to further test the model and gain insight into its sensitivity to precipitation pattern and vegetation cover. Integrating vegetation in urban planning is promoted to counter steer potential impacts of climate and demographic changes. Assessing the multiple benefits of such strategies on the urban microclimate requires a detailed coupling of both the water and energy transfers in numerical tools. In this respect, the representation of water-related processes in the urban subsoil of the existing model TEB-Veg has been improved. The new model thus allows a better evaluation of urban adaptation strategies. For various applications, a regional or local characterization of rainfall is required, particularly at the watershed scale, where there is spatial heterogeneity. Furthermore, simple models are needed that can simulate various scenarios of climate change including changes in seasonal wetness and rainstorm intensity. To this end, we have developed the STOchastic Rainstorm Model (STORM). We explain its developments and data requirements, and illustrate how it simulates rainstorms over a basin. The Earth’s land surface hydrology and physics can be represented in highly sophisticated models known as land surface models. The Land surface Data Toolkit (LDT) software was developed to meet these models’ input processing needs. LDT supports a variety of land surface and hydrology models and prepares the inputs (e.g., meteorological data, satellite observations to be assimilated into a model), which can be used for inter-model studies and to initialize weather and climate forecasts. This paper presents a new modeling package for the spatial interpolation of environmental variables. It includes 11 theoretical semivariogram models and four types of Kriging interpolations. To test the performances of the package, two applications are performed: the interpolation of 1 year of temperatures and a rainfall event. Both interpolations gave good results. In comparison with gstat, the SIK package proved to be a good alternative, regarding both the easiness of use and the accuracy. 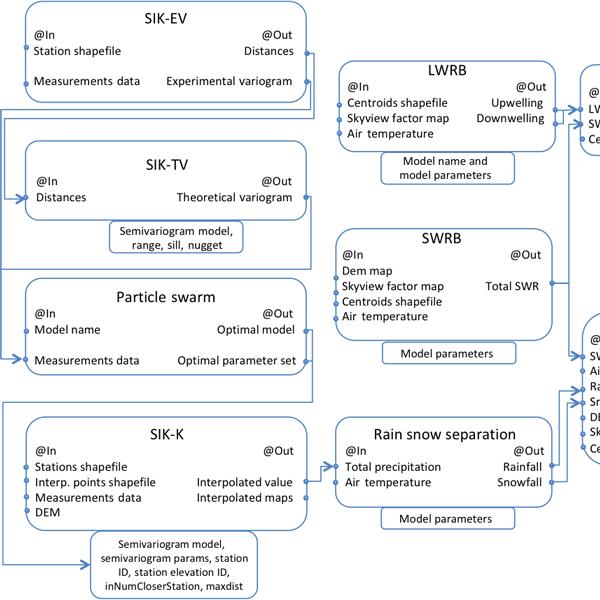 Our work addresses a key challenge in earth system modelling: how to optimally exploit the information contained in satellite remote sensing observations in the calibration of such models. For this we thoroughly test a number of measures that quantify the fit between an observed and a simulated spatial pattern. 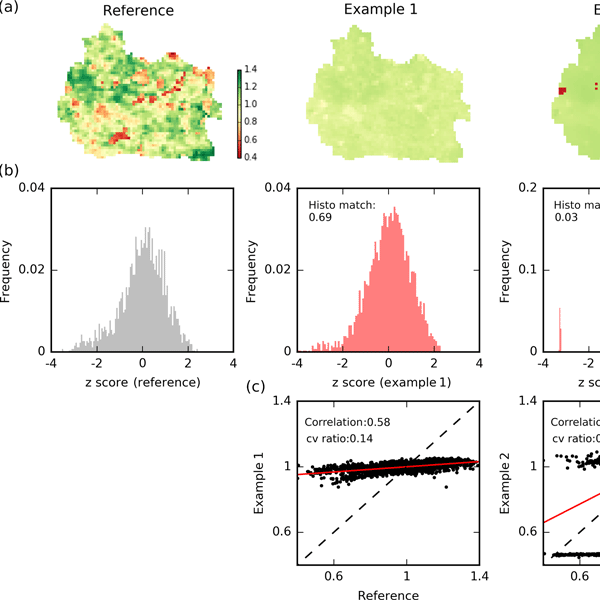 We acknowledge the difficulties associated with such a comparison and suggest using measures that regard multiple aspects of spatial information, i.e. magnitude and variability. Solutes introduced in the environment are transported by water to streams and lakes. The tran-SAS package includes a set of codes to model this process for entire watersheds by using the concept of water residence times, i.e. the time that water takes to move through the landscape. Results show that the model is implemented efficiently and it can be used to simulate solute transport in a number of different conditions. Many rainfall–runoff models are based on stores. However, the differential equations that describe the stores' evolution are rarely presented in literature. This represents an issue when the temporal resolution changes. 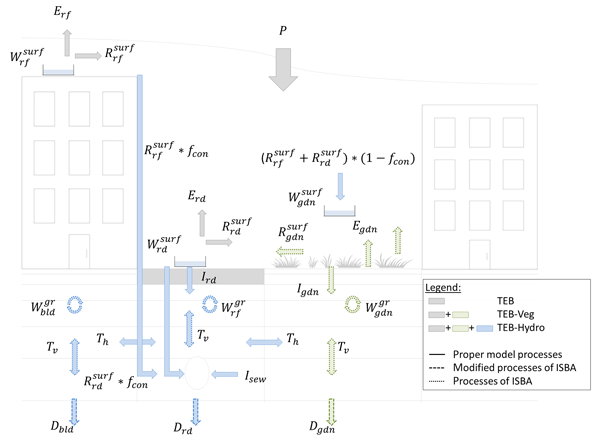 In this work, we propose and evaluate a state-space version of a simple rainfall–runoff model within a robust resolution scheme. The results show that the proposed model performs equally well or slightly better than the original one and is independent of the temporal resolution. 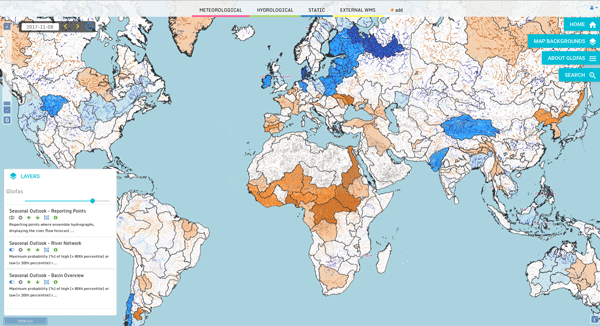 This hydrologic emulator provides researchers with an easy way to investigate the variations in water budgets at any spatial scale of interest, with minimum requirements of effort, reasonable model predictability, and appealing computational efficiency. 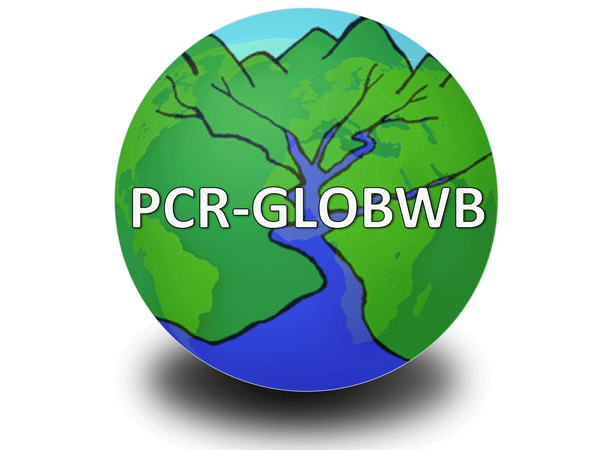 We expect it to have a profound influence on scientific endeavors in hydrological modeling and to excite the immediate interest of researchers working on climate impact assessments, uncertainty/sensitivity analysis, and integrated assessment. The land model integrated into the Energy Exascale Earth System Model was extended to include snow redistribution (SR) and lateral subsurface hydrologic and thermal processes. Simulation results at a polygonal tundra site near Barrow, Alaska, showed that inclusion of SR resulted in a better agreement with observations. Excluding lateral subsurface processes had a small impact on mean states but caused a large overestimation of spatial variability in soil moisture and temperature. Monitoring total suspended solids (TSS) concentration from satellites has unique advantages. Although many TSS retrieval models have been published, the general inversion method that is applicable to different field conditions is still under research. We studied many previous different satellite sensors models and finally developed a new model. To improve flood hazard assessments, it is vital to model all relevant processes. 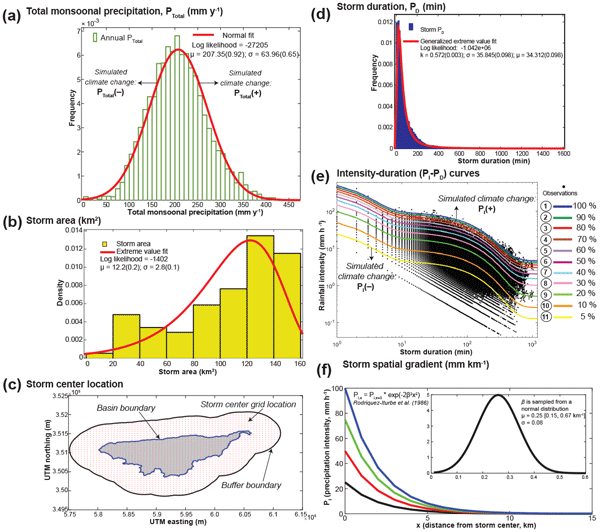 We here present GLOFRIM, a framework for coupling hydrologic and hydrodynamic models to increase the number of physical processes represented in hazard computations. GLOFRIM is openly available, versatile, and extensible with more models. Results also underpin its added value for model benchmarking, showing that not only model forcing but also grid properties and the numerical scheme influence output accuracy. The study of lakes often uses numerical models to reproduce the processes occurring in nature as accurately as possible. Due to the complexity of natural systems, all numerical models need to leave aside or simplify many of the relevant processes. In this work, we improve the modelling of the impact of wind on the internal currents in deep lakes. This improves the reproduction of deep mixing, which influences the concentrations of oxygen and nutrients, with biological and chemical consequences. To discretise and transfer a landscape into a hydrological model, many different algorithms and software implementations exist. These are, however, often model specific, commercial, and allow for only a limited workflow automation. Overcoming these limitations, the software package lumpR was developed. It employs an hillslope-based discretisation algorithm directed at large-scale application. The software is demonstrated in a case study and crucial discretisation parameters are investigated. 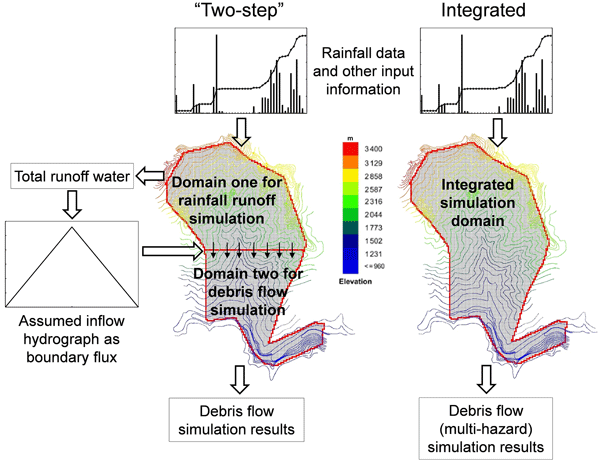 This paper presents Itzï, a new free software for the simulation of floods. It is integrated with a geographic information system (GIS), which reduces the human time necessary for preparing the entry data and analysing the results of the simulation. Itzï uses a simplified numerical scheme that permits to obtain results faster than with other types of models using more complex equations. In this article, Itzï is tested with three cases that show its suitability to simulate urban floods. This study shows that alleviating vegetation-caused biases in DEM data, refining channel cross-sectional geometry and Manning roughness coefficients, as well as accounting for backwater effects can effectively improve the modeling of streamflow, river stages and flood extent in the Amazon Basin. The obtained understanding could be helpful to hydrological modeling in basins with evident inundation, which has important implications for improving land–atmosphere interactions in Earth system models. 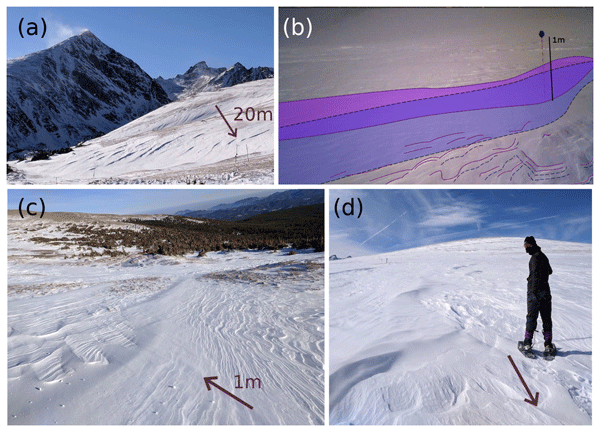 r.avaflow represents a GIS-based, multi-functional open-source tool for the simulation of debris flows, rock avalanches, snow avalanches, or two-phase (solid and fluid) process chains. It further facilitates parameter studies and validation of the simulation results against observed patterns. r.avaflow shall inform strategies to reduce the risks related to the interaction of mass flow processes with society. The paper presents an explicit bias-resampling approach from observations in order to simulate global warming scenarios and to investigate the implications for hydrometeorological variables. The author considers that the suggested approach is easy to implement and to employ in other fields that are influenced by global warming. This paper presents the improvements brought to an existing model for discharge and temperature prediction in Alpine streams. Compared to the original model version, it is now possible to choose between various alternatives to simulate certain parts of the water cycle, such as the technique used to transfer water along the stream network. The paper includes an example of application of the model over an Alpine catchment in Switzerland. Debris flows are characterized by unsteady flows of water with different content of clay, silt, sand, gravel, and large particles, resulting in a dense moving mixture mass. Here we present a three-dimensional fluid dynamic solver that simulates the flow as a mixture of a pressure-dependent rheology model of the gravel mixed with a Herschel–Bulkley rheology of the fine material suspension. We link rheological parameters to the material composition. The user must specify two free model parameters. Surface water and energy fluxes are essential components of the Earth system. The present paper introduces a new framework for the estimation of surface energy and water fluxes at the land surface, which allows for temporally and spatially high resolved flux estimates at the global scale. The framework maximizes the usage of existing long-term satellite data records. Overall the results indicate very good agreement with in situ observations when compared against 49 FLUXNET stations worldwide. mizuRoute version 1 is a stand-alone runoff routing tool that post-processes runoff outputs from any distributed hydrologic models to produce streamflow estimates in large-scale river network. mizuRoute is flexible to river network representation and includes two different river routing schemes. This paper demonstrates mizuRoute's capability of multi-decadal streamflow estimations in the river networks over the entire contiguous Unites States, which contains over 54 000 river segments. 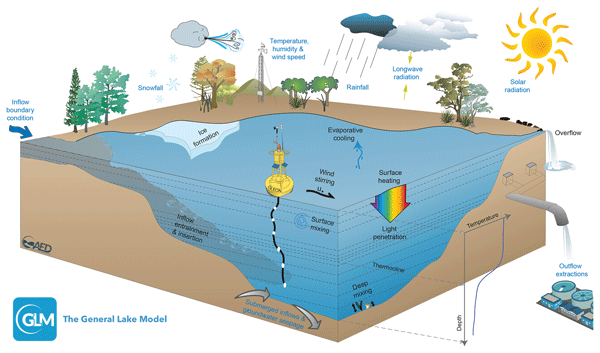 A 1-D lake model is presented, reproducing temperature, oxygen, carbon dioxide and methane. All prognostic variables are treated in unified manner via generic 1-D transport equation. The model is validated vs. comprehensive observational data set gathered at Kuivajärvi Lake (Finland). Our results suggest that a gas transfer through thermocline under intense seiche motions is a bottleneck in quantifying greenhouse gas dynamics in dimictic lakes, calling for further research. 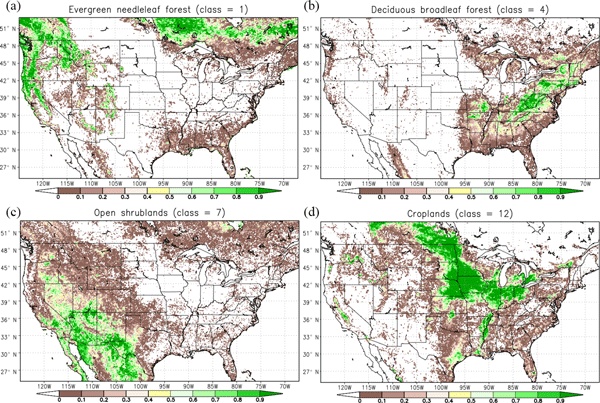 In an effort to develop a global terrestrial evaporation product, four models were forced using both a tower and grid-based data set. Comparisons against flux-tower observations from different biome and land cover types show considerable inter-model variability and sensitivity to forcing type. Results suggest that no single model is able to capture expected flux patterns and response. It is suggested that a multi-model ensemble is likely to provide a more stable long-term flux estimate. The Water Futures and Solutions (WFaS) initiative coordinates its work with other ongoing scenario efforts for the sake of establishing a consistent set of new global water scenarios based on the shared socio-economic pathways (SSPs) and the representative concentration pathways (RCPs). 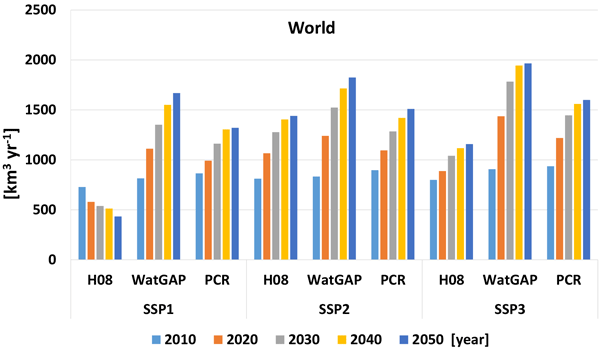 The WFaS "fast-track" assessment uses three global water models, H08, PCR-GLOBWB, and WaterGAP, to provide the first multi-model analysis of global water use for the 21st century based on the water scenarios. This technical paper presents a new tool to simulate reactive transport processes in subsurface systems and which couples the open-source software packages OpenGeoSys and IPhreeqc. 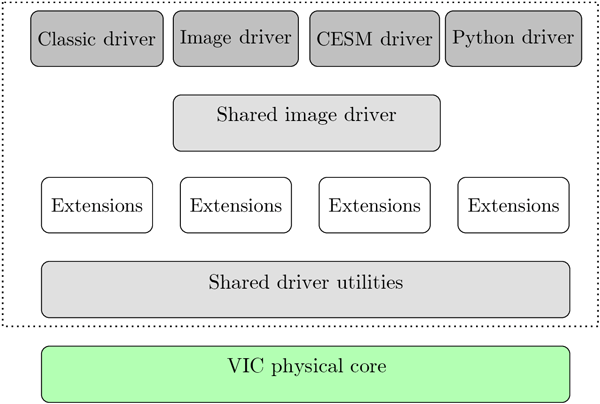 A flexible parallelization scheme was developed and implemented to enable an optimized allocation of computer resources. The performance tests of the coupling interface and parallelization scheme illustrate the promising efficiency of this generally valid approach to simulate reactive transport problems. Current land surface models (LSMs) poorly represent irrigation impacts on regional hydrology. Approaches to include irrigation in LSMs are based on either potentially outdated irrigation inventory data or soil moisture curves that are not constrained by regional water balances. We use satellite remote sensing of actual ET and groundwater depletion to develop recent estimates of regional irrigation data. 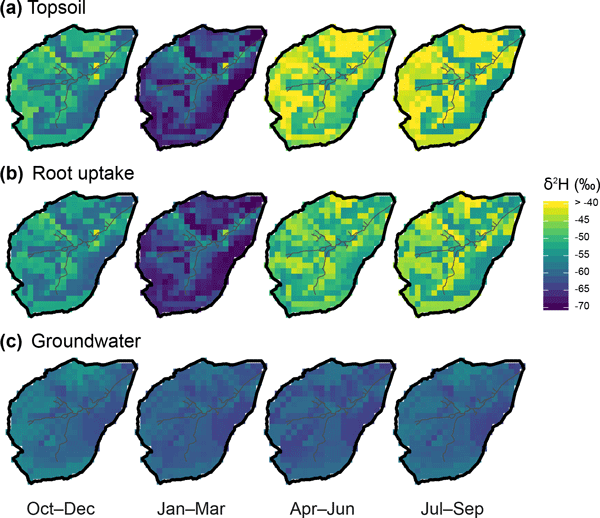 Remote sensing parameterizations of irrigation improve model performance. This paper introduces the Spatial Processes in HYdrology (SPHY) model (v2.0), its underlying concepts, and some example applications. SPHY has the flexibility to be applied in a wide range of hydrologic applications, on various scales, and can easily be implemented. The most relevant hydrologic processes integrated in the SPHY model are rainfall--runoff, cryosphere processes, evapotranspiration processes, the dynamic evolution of evolution of vegetation cover, and lake/reservoir outflow. Irrigation agriculture is required to sustain yields that allow feeding the world population. A robust assessment of irrigation requirement (IRR) relies on a sound quantification of evapotranspiration (ET). We prepared a multi-model ensemble considering several ET methods and investigate uncertainties in simulating IRR. More generally, we provide an example of the value of investigating the uncertainty in models that may be used to inform policy-making and to elaborate best management practices. Ahnert, F.: Brief description of a comprehensive three-dimensional process-response model of landform development, Z. Geomorfol., Supplementband, 25, 29–49, 1976. Andrews, D. J. and Bucknam, R. C.: Fitting degradation of shoreline scarps by a nonlinear diffusion model, J. Geophys. Res., 92, 12857–12867, https://doi.org/10.1029/JB092iB12p12857, 1987. Andrews, D. J. and Hanks, T. C.: Scarp degraded by linear diffusion: Inverse solution for age, J. Geophys. Res., 90, 10193–10208, https://doi.org/10.1029/JB090iB12p10193, 1985. 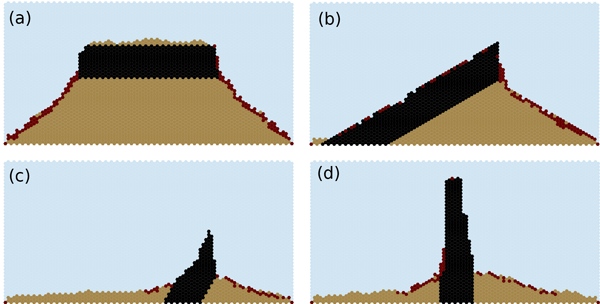 Attal, M., Tucker, G. E., Whittaker, A. C., Cowie, P. A., and Roberts, G. P.: Modeling fluvial incision and transient landscape evolution: Influence of dynamic channel adjustment, J. Geophys. Res., 113, F03013, https://doi.org/10.1029/2007JF000893, 2008. Attal, M., Cowie, P., Whittaker, A., Hobley, D., Tucker, G., and Roberts, G.: Testing fluvial erosion models using the transient response of bedrock rivers to tectonic forcing in the Apennines, Italy, J. Geophys. Res., 116, F02005, https://doi.org/10.1029/2010JF001875, 2011. Barnhart, K. R., Shobe, C. M., Glade, R. C., Tucker, G. E., and Hutton, E.: TerrainBento/terrainbento: Soba (Version v1.0.0), Zenodo, https://doi.org/10.5281/zenodo.2566501, 2019a. Barnhart, K. R., Shobe, C. M., Glade, R. C., and Tucker, G. E.: TerrainBento/examples_tests_and_tutorials: Soba (Version v1.0.0), Zenodo, https://doi.org/10.5281/zenodo.2566608, 2019b. Beven, K. and Kirkby, M.: A physically based, variable contributing area model of basin hydrology, Hydrolog. Sci. J., 24, 43–69, 1979. Bishop, P.: Long-term landscape evolution: linking tectonics and surface processes, Earth Surf. Proc. Landf., 32, 329–365, 2007. Carretier, S. and Lucazeau, F.: How does alluvial sedimentation at range fronts modify the erosional dynamics of mountain catchments?, Basin Res., 17, 361–381, 2005. Carretier, S., Martinod, P., Reich, M., and Godderis, Y.: Modelling sediment clasts transport during landscape evolution, Earth Surf. Dynam., 4, 237–251, https://doi.org/10.5194/esurf-4-237-2016, 2016. Chen, A., Darbon, J., and Morel, J.-M.: Landscape evolution models: A review of their fundamental equations, Geomorphology, 219, 68–86, https://doi.org/10.1016/j.geomorph.2014.04.037, 2014. Codilean, A. T., Bishop, P., and Hoey, T. B.: Surface process models and the links between tectonics and topography, Prog. Phys. Geog., 30, 307–333, 2006. Cohen, S., Willgoose, G., and Hancock, G.: The mARM3D spatially distributed soil evolution model: Three-dimensional model framework and analysis of hillslope and landform responses, J. Geophys. Res., 115, F04013, https://doi.org/10.1029/2009JF001536, 2010. Coulthard, T. J.: Landscape evolution models: a software review, Hydrol. Process., 15, 165–173, 2001. Culling, W. E. H.: Soil Creep and the Development of Hillside Slopes, J. Geol., 71, 127–161, 1963. Davy, P. and Lague, D.: Fluvial erosion/transport equation of landscape evolution models revisited, J. Geophys. Res., 114, F03007, https://doi.org/10.1029/2008JF001146, 2009. 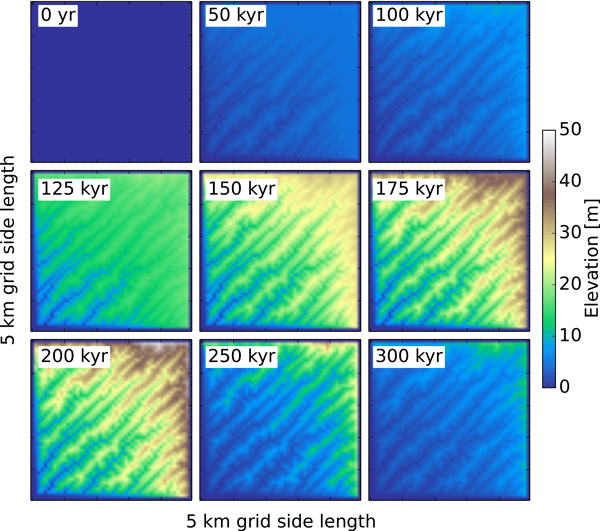 DiBiase, R. and Whipple, K.: The influence of erosion thresholds and runoff variability on the relationships among topography, climate, and erosion rate, J. Geophys. Res., 116, F04036, https://doi.org/10.1029/2011JF002095, 2011. Dietrich, W., Wilson, C., Montgomery, D., and McKean, J.: Analysis of erosion thresholds, channel networks, and landscape morphology using a digital terrain model, J. Geol., 101, 259–278, 1993. Dietrich, W. E., Bellugi, D. G., Sklar, L. S., Stock, J. D., Heimsath, A. M., and Roering, J. J.: Geomorphic transport laws for predicting landscape form and dynamics, in: Prediction in geomorphology, edited by: Wilcock, P. and Iverson, R., Geophysical Monograph Series, AGU, Washington, D.C., https://doi.org/10.1029/135GM09, 2003. Doane, T. H., Furbish, D. J., Roering, J. J., Schumer, R., and Morgan, D. J.: Nonlocal Sediment Transport on Steep Lateral Moraines, Eastern Sierra Nevada, California, USA, J. Geophys. Res.-Earth, 123, 187–208, https://doi.org/10.1002/2017JF004325, 2018. Dunne, T. and Black, R.: Partial area contributions to storm runoff in a small New England watershed, Water Resour. Res., 6, 1296–1311, 1970. Duvall, A., Kirby, E., and Burbank, D.: Tectonic and lithologic controls on bedrock channel profiles and processes in coastal California, J. Geophys. Res., 109, F03002, https://doi.org/10.1029/2003JF000086, 2004. Duvall, A. R. and Tucker, G. E.: Dynamic Ridges and Valleys in a Strike-Slip Environment, J. Geophys. Res.-Earth, 120, 2016–2026, 2015. Eagleson, P.: Climate, soil, and vegetation, 2, The distribution of annual precipitation derived from observed storm sequences, Water Resour. Res., 14, 713–721, 1978. Freeman, T. G.: Calculating catchment area with divergent flow based on a regular grid, Comput. Geosci., 17, 413–422, https://doi.org/10.1016/0098-3004(91)90048-I, 1991. Ganti, V., Passalacqua, P., and Foufoula-Georgiou, E.: A sub-grid scale closure for nonlinear hillslope sediment transport models, J. Geophys. Res., 117, F02012, https://doi.org/10.1029/2011JF002181, 2012. Gasparini, N., Tucker, G., and Bras, R.: Network-scale dynamics of grain-size sorting: Implications for downstream fining, stream-profile concavity, and drainage basin morphology, Earth Surf. Proc. Land., 29, 401–421, https://doi.org/10.1002/esp.1031, 2004. Gran, K. B., Finnegan, N., Johnson, A. L., Belmont, P., Wittkop, C., and Rittenour, T.: Landscape evolution, valley excavation, and terrace development following abrupt postglacial base-level fall, Geol. Soc. Am. Bull., 125, 1851–1864, 2013. Gray, H. J., Shobe, C. M., Hobley, D. E. J., Tucker, G. E., Duvall, A. R., Harbert, S. A., and Owen, L. A.: Off-fault deformation rate along the southern San Andreas fault at Mecca Hills, southern California, inferred from landscape modeling of curved drainages, Geology, 46, 59–62, https://doi.org/10.1130/G39820.1, 2018. Hancock, G. and Willgoose, G.: Use of a landscape simulator in the validation of the SIBERIA catchment evolution model: Declining equilibrium landforms, Water Resour. Res., 37, 1981–1992, 2001. Hancock, G., Lowry, J., Coulthard, T., Evans, K., and Moliere, D.: A catchment scale evaluation of the SIBERIA and CAESAR landscape evolution models, Earth Surf. Proc. Land., 35, 863–875, 2010. Hanks, T. C.: The Age of Scarplike Landforms From Diffusion-Equation Analysis, in: Quaternary Geochronology, edited by: Noller, J. S., Sowers, J. M., and Lettis, W. R., https://doi.org/doi:10.1029/RF004p0313, 2013. Heimsath, A., Dietrich, W., Nishiizumi, K., and Finkel, R.: The soil production function and landscape equilibrium, Nature, 388, 358–361, 1997. Herman, F. and Braun, J.: A parametric study of soil transport mechanisms, in: Special Paper: Tectonics, Climate, and Landscape Evolution, Geological Society of America, 398, 191–200, https://doi.org/10.1130/2006.2398(11), 2006. Hill, M. C., Kavetski, D., Clark, M., Ye, M., Arabi, M., Lu, D., Foglia, L., and Mehl, S.: Practical use of computationally frugal model analysis methods, Groundwater, 54, 159–170, 2016. Hobley, D. E., Sinclair, H. D., Mudd, S. M., and Cowie, P. A.: Field calibration of sediment flux dependent river incision, J. Geophys. Res., 116, F04017, https://doi.org/10.1029/2010JF001935, 2011. Howard, A. D.: A detachment-limited model of drainage basin evolution, Water Resour. Res., 30, 2261–2285, 1994. Howard, A. D. and Kerby, G.: Channel changes in badlands, Geol. Soc. Am. Bull., 94, 739–752, 1983. Howard, A. D., Dietrich, W. E., and Seidl, M. A.: Modeling fluvial erosion on regional to continental scales, J. Geophys. Res., 99, 13971–13986, 1994. 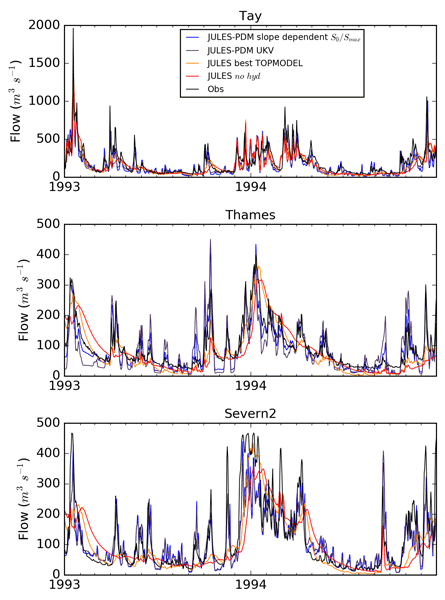 Huang, X. and Niemann, J.: An evaluation of the geomorphically effective event for fluvial processes over long periods, J. Geophys. Res., 111, F03015, https://doi.org/10.1029/2006JF000477, 2006. Ijjasz-Vasquez, E. J., Bras, R. L., and Rodriguez-Iturbe, I.: Hack's relation and optimal channel networks: The elongation of river basins as a consequence of energy minimization, Water Resour. Res., 20, 1583–1586, 1993. Ivanov, V. Y., Bras, R. L., and Curtis, D. C.: A weather generator for hydrological, ecological, and agricultural applications, Water Resour. Res., 43, W10406, https://doi.org/10.1029/2006WR005364, 2007. Johnstone, S. A. and Hilley, G. E.: Lithologic control on the form of soil-mantled hillslopes, Geology, 43, 83–86, 2015. Julien, P.: Erosion and sedimentation, 2nd edn., Cambridge University Press, Cambridge, 2010. 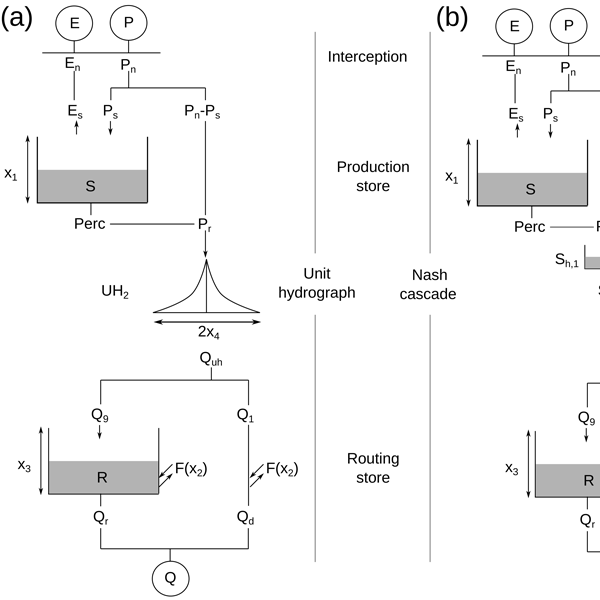 Kavetski, D. and Kuczera, G.: Model smoothing strategies to remove microscale discontinuities and spurious secondary optima in objective functions in hydrological calibration, Water Resour. Res., 43, W03411, https://doi.org/10.1029/2006WR005195, 2007. Kirby, E. and Whipple, K.: Quantifying differential rock-uplift rates via stream profile analysis, Geology, 29, 415–418, 2001. Kirchner, J. W., Dietrich, W. E., Iseya, F., and Ikeda, H.: The variability of critical shear stress, friction angle, and grain protrusion in water-worked sediments, Sedimentology, 37, 647–672, https://doi.org/10.1111/j.1365-3091.1990.tb00627.x, 1990. Kooi, H. and Beaumont, C.: Escarpment evolution on high-elevation rifted margins: Insights derived from a surface processes model that combines diffusion, advection, and reaction, J. Geophys. Res., 99, 12191–12209, 1994. Lague, D.: Reduction of long-term bedrock incision efficiency by short-term alluvial cover intermittency, J. Geophys. Res., 115, F02011, https://doi.org/10.1029/2008JF001210, 2010. Lague, D., Hovius, N., and Davy, P.: Discharge, discharge variability, and the bedrock channel profile, J. Geophys. Res, 110, F04006, https://doi.org/10.1029/2004JF000259, 2005. Lavé, J. and Avouac, J.: Fluvial incision and tectonic uplift across the Himalayas of central Nepal, J. Geophys. Res., 106, 26561–26591, https://doi.org/10.1029/2001JB000359, 2001. Loget, N., Davy, P., and Van Den Driessche, J.: Mesoscale fluvial erosion parameters deduced from modeling the Mediterranean sea level drop during the Messinian (late Miocene), J. Geophys. Res., 111, F03005, https://doi.org/10.1029/2005JF000387, 2006. Martin, Y. and Church, M.: Numerical modelling of landscape evolution: Geomorphological perspectives, Prog. Phys. Geog., 28, 317–339, 2004. McEwan, I. and Heald, J.: Discrete particle modeling of entrainment from flat uniformly sized sediment beds, J. Hydraul. Eng., 127, 588–597, 2001. Miller, S. R. and Slingerland, R. L.: Topographic advection on fault-bend folds: Inheritance of valley positions and the formation of wind gaps, Geology, 34, 769–772, 2006. Miller, S. R., Slingerland, R. L., and Kirby, E.: Characteristics of steady state fluvial topography above fault-bend folds, J. Geophys. Res., 112, F04004, https://doi.org/10.1029/2007JF000772, 2007. O'Callaghan, J. F. and Mark, D. M.: The extraction of drainage networks from digital elevation data, Comput. Vision Graph., 28, 323–344, https://doi.org/10.1016/S0734-189X(84)80011-0, 1984. O'Loughlin, E.: Prediction of surface saturation zones in natural catchments by topographic analysis, Water Resour. Res., 22, 794–804, 1986. Pazzaglia, F. J.: Landscape evolution models, Developments in Quaternary Sciences, 1, 247–274, 2003. Peckham, S. D., Hutton, E. W., and Norris, B.: A component-based approach to integrated modeling in the geosciences: The design of CSDMS, Comput. Geosci., 53, 3–12, 2013. Pelletier, J.: 2.3 Fundamental Principles and Techniques of Landscape Evolution Modeling, in: Treatise on Geomorphology, edited by: Shroder, J. F., Academic Press, San Diego, 29–43, https://doi.org/10.1016/B978-0-12-374739-6.00025-7, 2013. Pelletier, J. D.: How do pediments form? : A numerical modeling investigation with comparison to pediments in southern Arizona, USA, Geol. Soc. Am. Bull., 122, 1815–1829, 2010. Pelletier, J. D., DeLong, S. B., Al-Suwaidi, A. H., Cline, M., Lewis, Y., Psillas, J. L., and Yanites, B.: Evolution of the Bonneville shoreline scarp in west-central Utah: Comparison of scarp-analysis methods and implications for the diffusion model of hillslope evolution, Geomorphology, 74, 257–270, https://doi.org/10.1016/j.geomorph.2005.08.008, 2006. Pelletier, J. D., McGuire, L. A., Ash, J. L., Engelder, T. M., Hill, L. E., Leroy, K. W., Orem, C. A., Rosenthal, W. S., Trees, M. A., Rasmussen, C., and Chorover, J.: Calibration and testing of upland hillslope evolution models in a dated landscape: Banco Bonito, New Mexico, J. Geophys. Res., 116, F04004, https://doi.org/10.1029/2011JF001976, 2011. Perron, J. T., Kirchner, J. W., and Dietrich, W. E.: Formation of evenly spaced ridges and valleys, Nature, 460, 502–505, 2009. Petit, C., Gunnell, Y., Saholiariliva, N. G., Meyer, B., and Séguinot, J.: Faceted spurs at normal fault scarps: Insights from numerical modeling, J. Geophys. Res., 114, B05403, https://doi.org/10.1029/2008JB005955, 2009. Roering, J.: How well can hillslope evolution models “explain” topography? Simulating soil transport and production with high-resolution topographic data, Geol. Soc. Am. Bull., 120, 1248–1262, 2008. Roering, J., Kirchner, J., and Dietrich, W.: Evidence for nonlinear, diffusive sediment transport on hillslopes and implications for landscape morphology, Water Resour. Res., 35, 853–870, 1999. Roering, J., Kirchner, J., Sklar, L., and Dietrich, W.: Hillslope evolution by nonlinear creep and landsliding: An experimental study, Geology, 29, 143–146, 2001. Rossi, M. W., Whipple, K. X., and Vivoni, E. R.: Precipitation and evapotranspiration controls on daily runoff variability in the contiguous United States and Puerto Rico, J. Geophys. Res.-Earth, 121, 128–145, 2016. Shobe, C. M., Tucker, G. E., and Barnhart, K. R.: The SPACE 1.0 model: a Landlab component for 2-D calculation of sediment transport, bedrock erosion, and landscape evolution, Geosci. Model Dev., 10, 4577–4604, https://doi.org/10.5194/gmd-10-4577-2017, 2017. Small, E., Anderson, R., and Hancock, G.: Estimates of the rate of regolith production using 10Be and 26Al from an alpine hillslope, Geomorphology, 27, 131–150, 1999. Snyder, N. P., Whipple, K. X., Tucker, G. E., and Merritts, D. J.: Landscape response to tectonic forcing: Digital elevation model analysis of stream profiles in the Mendocino triple junction region, northern California, Bull. Geol. Soc. Am., 112, 1250–1263, https://doi.org/10.1130/0016-7606(2000)112<1250:LRTTFD>2.0.CO;2, 2000. Snyder, N. P., Whipple, K. X., Tucker, G. E., and Merritts, D. J.: Importance of a stochastic distribution of floods and erosion thresholds in the bedrock river incision problem, J. Geophys. Res., 108, 2117, https://doi.org/10.1029/2001JB001655, 2003a. Snyder, N. P., Whipple, K. X., Tucker, G. E., and Merritts, D. J.: Channel response to tectonic forcing: analysis of stream morphology and hydrology in the Mendocino triple junction region, northern California, Geomorphology, 53 97–127, 2003b. Soil Survey Staff: Soil taxonomy: A basic system of soil classification for making and interpreting soil surveys, 2nd edn., Natural Resources Conservation Service, U.S. Department of Agriculture Handbook, 436 pp., 1999. Stock, J. D. and Montgomery, D. R.: Geologic constraints on bedrock river incision using the stream power law, J. Geophys. Res., 104, 4983–4993, 1999. Tarboton, D. G.: A new method for the determination of flow directions and upslope areas in grid digital elevation models, Water Resour. Res., 33, 309–319, https://doi.org/10.1029/96WR03137, 1997. Temme, A., Schoorl, J., Claessens, L., and Veldkamp, A.: 2.13 Quantitative modeling of landscape evolution, in: Treatise on Geomorphology, edited by: Shroder, J. F., Academic Press, San Diego, 180–200, https://doi.org/10.1016/B978-0-12-374739-6.00039-7, 2013. Tomkin, J. H., Brandon, M. T., Pazzaglia, F. J., Barbour, J. R., and Willett, S. D.: Quantitative testing of bedrock incision models for the Clearwater River, NW Washington State, J. Geophys. Res., 108, 2308, https://doi.org/10.1029/2001JB000862, 2003. Tucker, G. E.: Drainage basin sensitivity to tectonic and climatic forcing: Implications of a stochastic model for the role of entrainment and erosion thresholds, Earth Surf. Proc. Land., 29, 185–205, https://doi.org/10.1002/esp.1020, 2004. Tucker, G. E. and Bras, R. L.: Hillslope processes, drainage density, and landscape morphology, Water Resour. Res., 36, 1953–1964, 1998. Tucker, G. E. and Bras, R. L.: A stochastic approach to modeling the role of rainfall variability in drainage basin evolution, Water Resour. Res., 36, 1953–1964, 2000. Tucker, G. E. and Hancock, G. R.: Modelling Landscape Evolution, Earth Surf. Proc. Land., 46, 28–50, 2010. Tucker, G. E. and Slingerland, R. L.: Drainage basin response to climate change, Water Resour. Res., 33, 2031–2047, 1997. Tucker, G. E. and Whipple, K. X.: Topographic outcomes predicted by stream erosion models: Sensitivity analysis and intermodel comparison, J. Geophys. Res., 107, 2179, https://doi.org/10.1029/2001JB000162, 2002. 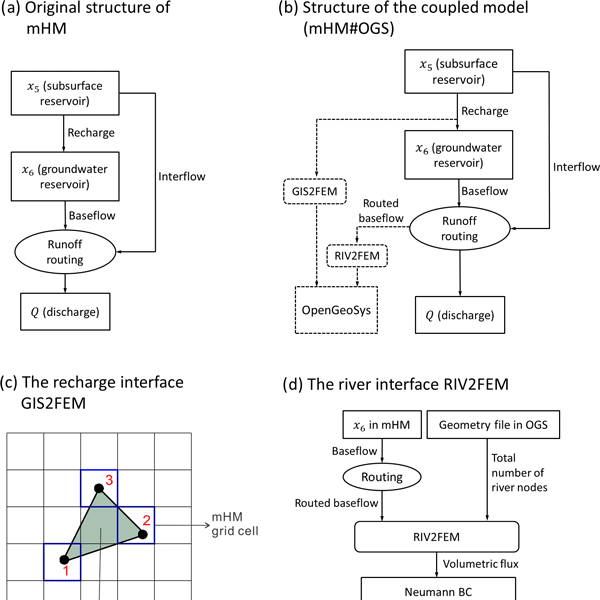 Tucker, G. E., Lancaster, S. T., Gasparini, N. M., Bras, R. L., and Rybarczyk, S. M.: An object-oriented framework for hydrologic and geomorphic modeling using triangular irregular networks, Comput. Geosci., 27, 959–973, 2001. Valla, P., van der Beek, P., and Lague, D.: Fluvial incision into bedrock: Insights from morphometric analysis and numerical modeling of gorges incising glacial hanging valleys (Western Alps, France), J. Geophys. Res., 115, F02010, https://doi.org/10.1029/2008JF001079, 2010. Valters, D.: Modelling Geomorphic Systems: Landscape Evolution, in: Geomorphological Techniques, British Society for Geomorphology, UK, 12, 1–24, 2016.
van der Beek, P. and Bishhop, P.: Cenozoic river profile development in the Upper Lachlan catchment (SE Australia) as a test quantitative fluvial incision models, J. Geophys. Res., 108, 2309, https://doi.org/10.1029/2002JB002125, 2003. Vanwalleghem, T., Stockmann, U., Minasny, B., and McBratney, A. B.: A quantitative model for integrating landscape evolution and soil formation, J. Geophys. Res.-Earth, 118, 331–347, https://doi.org/10.1029/2011JF002296, 2013. 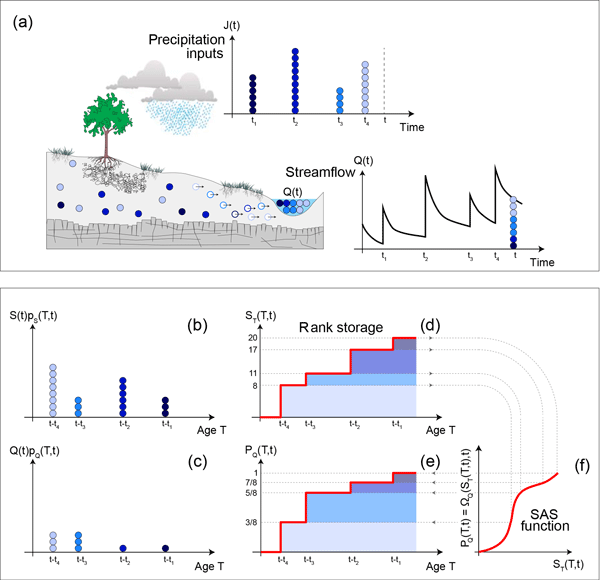 Whipple, K. X. and Tucker, G. E.: Dynamics of the stream-power river incision model: Implications for height limits of mountain ranges, landscape response timescales, and research needs, J. Geophys. Res., 104, 17661–17674, 1999. Whipple, K. X., Hancock, G. S., and Anderson, R. S.: River incision into bedrock: Mechanics and relative efficacy of plucking, abrasion, and cavitation, Geol. Soc. Am. Bull., 112, 490–503, 2000a. Whipple, K. X., Snyder, N. P., and Dollenmayer, K.: Rates and processes of bedrock incision by the Upper Ukak River since the 1912 Novarupta ash flow in the Valley of Ten Thousand Smokes, Alaska, Geology, 28, 835–838, 2000b. Whittaker, A., Cowie, P., Attal, M., Tucker, G., and Roberts, G.: Contrasting transient and steady-state rivers crossing active normal faults: new field observations from the Central Apennines, Italy, Basin Res., 19, 529–556, 2007. Wilcock, P. R. and McArdell, B. W.: Partial transport of a sand/gravel sediment, Water Resour. Res., 33, 235–245, https://doi.org/10.1029/96WR02672, 1997. Willgoose, G.: Mathematical modeling of whole landscape evolution, Annu. Rev. Earth Pl. Sc., 33, 14.1–14.17, 2005. Willgoose, G., Bras, R. L., and Rodriguez-Iturbe, I.: A physical explanation of an observed link area-slope relationship, Water Resour. Res., 27, 1697–1702, 1991. Willgoose, G. R. and Hancock, G. R.: Applications of long-term erosion and landscape evolution models, in: Handbook of Erosion Modelling, John Wiley & Sons, Ltd, 18, 339–359, 2011. Willgoose, G. R., Hancock, G. R., and Kuczera, G.: A Framework for the Quantitative Testing of Landform Evolution Models, in: Prediction in Geomorphology, edited by: Wilcock, P. R. and Iverson, R. M.,, American Geophysical Union (AGU), Washington, D.C., 195–216, https://doi.org/10.1029/135GM14, 2003. 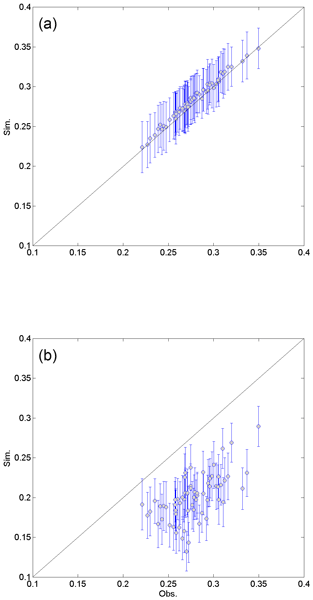 Wilson, P. and Toumi, R.: A fundamental probability distribution for heavy rainfall, Geophys. Res. Lett., 32, L14812, https://doi.org/10.1029/2005GL022465, 2005. Wohl, E. and David, G. C. L.: Consistency of scaling relations among bedrock and alluvial channels, J. Geophys. Res., 113, F04013, https://doi.org/10.1029/2008JF000989, 2008. Yanites, B., Tucker, G., Mueller, K., Chen, Y., Wilcox, T., Huang, S., and Shi, K.: Incision and channel morphology across active structures along the Peikang River, central Taiwan: Implications for the importance of channel width, Geol. Soc. Am. Bull., 122, 1192–1208, https://doi.org/10.1130/B30035.1, 2010. Zhang, L., Parker, G., Stark, C. P., Inoue, T., Viparelli, E., Fu, X., and Izumi, N.: Macro-roughness model of bedrock-alluvial river morphodynamics, Earth Surf. Dynam., 3, 113–138, https://doi.org/10.5194/esurf-3-113-2015, 2015.